I went to Flikr and searched for nursery rhymes. 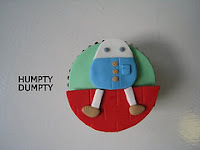 I found this picture of Humpty Dumpty. I think it would be cute to share with the kids. It is made with food. That is such a cute idea! I may use that next year, if you don't mind with nursery rhymes.